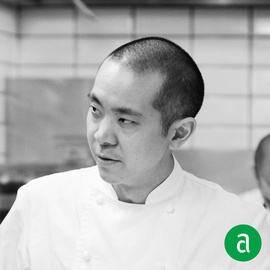 Corey Chow, Chef de Cuisine at Per Se in New York City, shares his career timeline and words of advice for up-and-coming professionals. Wade and Michelle Ueoka at MW Restaurant in Hawaii, who I worked with at Alan Wong’s, helped me become who I am today. They both really embody hospitality and the “Aloha spirit.” Rich Torrisi helped me see another way of looking at food. Eli Kaimeh has been a huge influence on my career at Per Se. David Breeden, the CDC of The French Laundry has been both a colleague and teacher, helping me to find my inspiration. Alan Wong’s was my first fine dining experience. Being submersed in another culture and really experiencing the restaurant industry for the first time was so impactful. I made lifelong friends and mentors, during my time as an extern and later a chef de partie. Humility and attitude will often take you farther than knowledge or skill. Mentoring others is so important, as your team is only as strong as its weakest link. As you progress in your career, you are defined by the work ethic, passion, and commitment of your team. While it’s important to look ahead, it is also important to be true to yourself and where you come from. Always have a positive attitude and be humble; those are the people that I want to be surrounded by. I hope that by being excited and passionate myself, it translates to the team and gets them motivated and inspired. A leader should set the tone and standard every single day. Eating out is important; my favorite restaurants are still the simple / family types. I read new material, but also look back a lot at old family recipes or techniques and see how I can incorporate them into my repertoire. If our guests are happy, then WE (the collective service and culinary teams) are doing our jobs. Also knowing that a Chef de Partie has improved or learned something new, makes me want to share more. I was once told by David Breeden, “if we improve 1% every day, then in one year we have improved 365%”. Be hungry and always strive for more. Never be satisfied with what you did yesterday, but push to be better the next day. Don’t give up. I was very humbled when I did not originally get the job as a Commis at Per Se. It made me look at things differently and see what it takes to be at the top of our profession.